Florals are always fashionable. 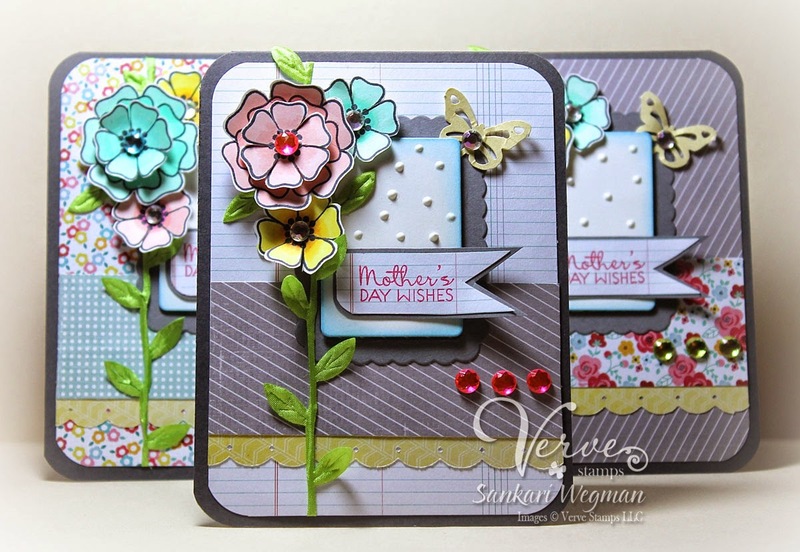 Let your creativity bloom and use some fabulous florals on your card. Use the inspiration graphic as a starting point, or head off in your own direction – just show us some blooms! Loved making these cards and can't wait to see what the DT has created with this challenge!! Please join in to the challenge and stamp away with us!! Challenge deadline: Sunday, May 20. Prize: $25 gift voucher to the Verve online store! Wow,this ia a gorgeous set of Motherday cards. Sankari I love the little garden of cards you've created - some Mom is going to be very happy! These are just so cute! I love all the fun patterns together! Beautiful Mother's Day cards. Love the flowers. Ohhhh I LOVE this card! Everything about it makes me smile. Oh! Your cards are so super sweet! The patterns and colors are delightful! very pretty for Mother's Day! Your cards are beautiful. I loVE your pretty flowers and their bling centers. Thanks for sharing. Love the way you created the stem for the flowers...they kind of look like hollyhocks. these are so sweet and beautiful What a great gift set. I love all your layers and added bling the butterfly is such a sweet addition to. I love it. beautiful cards!! lovely flowers... and the pattern papers are very beautiful.... perfect for Mothers.. These cards are adorable! Love the flowers and such fun backgrounds! Amazing how different color combinations will change the look of a project. these cards looks so beautiful! Amazing, love all the details on your cards. Wonderful card design for this set. Beautiful cards! I love your colors. 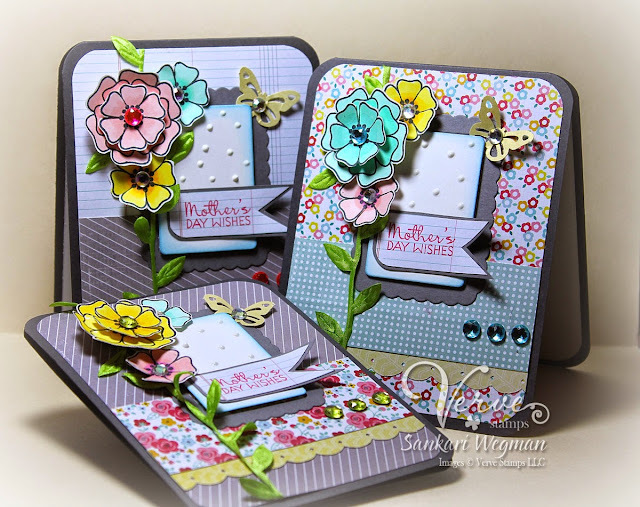 These are so adorable with all the layering, embossing and fun bright flowers! Oh my! Oh my goodness! Your cards are adorable! The layered flowers with the long stem are amazing. I also love this sketch. Lovely Mother's Day cards! The layered flowers look amazing! Great layout! How lovely! It's fun to see how changing the papers creates wonderful variety between the cards. Wow I knew I was going to see colour here today and boy did I. As always beautiful cards you have shared with us all. Love all the layers. Gorgeous set of cards. I love all your layers. There is a lot going on, but your design brings it together wonderfully. 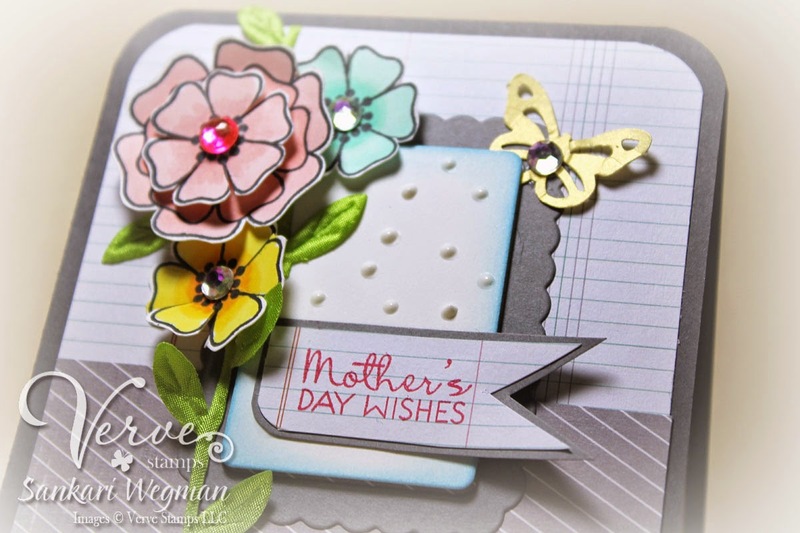 Beautiful Mother's Day cards! Love the pretty blooms and the layering! Fun dimension on the flowers too! What a lucky Mom who receives one of these beautiful cards. Ooo . . these are gorgeous!! "Joyful Blooms" is probably my favorite Verve set and I love how you have used it here. The flowers look perfect growing on those stems. Wow! These are positively GORGEOUS, Sankari! Total smilemakers! Gorgeous card set! Love all the details! Oh, these are so pretty! Love the spring colors! What gorgeous card and I love it that you made a set. The "Mothers on your lives" will love these. You've added such pretty papers too. Oh how pretty! Love the layered flowers! Love the dimension in your pretty set!! The floral colors are perfect with the background papers-beautiful. Wow, these cards get a 10+ on the cuteness factor scale. I love all the combinations of DP, and the flowers are so stinkin' cute.